In Netflix’s new limited series The Haunting of Hill House, series creator Mike Flanagan re-imagines author Shirley Jackson’s same-titled horror novel from 1959. Flanagan deftly weaves together the past and present lives of the Crain family, who briefly lived in the haunted mansion known as Hill House. Though the family fled the house, its ghosts followed them, and the family is eventually drawn back to the mansion for a final showdown. Emmy-award winning supervising sound editor/sound designer Trevor Gates at Formosa Group knows a thing or two about crafting sound for a horror story. In fact, he and his sound team were recently awarded an Emmy for their work on Atlanta‘s “Teddy Perkins” episode, which takes place inside the creepy mansion of a reclusive aristocrat. Gates’s aesthetic choices for that episode — oppressive ambiences and precise, articulate sound effects are evident in The Haunting of Hill House. It’s his sonic precision that makes the soundtrack on this series so effective. The restrained use of sound draws the audience in so that when a scare happens, it has space to be loud and scary as hell. Here, Gates talks about his approach to The Haunting of Hill House and shares some advice on how to create an effective horror soundtrack. What were series creator Mike Flanagan’s goals for sound on The Haunting of Hill House? You’ve worked with him on other horror films. How did this series compare to those, sound-wise? Trevor Gates (TG): I’ve worked with Mike on Ouija: Origin of Evil and also Gerald’s Game. Re-recording mixer Jonathan Wales, who worked with us on The Haunting of Hill House, was also on those two films, plus one called Hush. So we have a long-standing relationship with Mike Flanagan, which is going to continue. One of the most difficult things about this series was the schedule. Our time was severely truncated. We had a two week lead time on the first mix and then we started mixing and we didn’t stop for eight weeks straight. So to do 10 episodes in 10 weeks we had to be pretty in tune with the director, and we had to have a really good sound crew. This project was easier than the others because I have a relationship with Mike and I know what’s in his DNA and what his expectations are sound-wise. We didn’t have to explore a bunch of directions to discover where the thresholds were, to find out what flavors we were looking for. I could just jump right in. The best thing about working with Mike Flanagan is that his writing is so good. He likes to embrace the silence in his films. So just like with “Teddy Perkins,” we could create some very basic atmospheres to communicate isolation, like clock ticks and heavy airs. We could hold a ‘silence’ and let these really interesting monologues breathe and live in the space. Whatever choices we needed to make needed to translate to that playback environment, to sound bars and even headphones. Along with that, there are some pretty big, isolated scares where we have screams and banging. There were a few scenes where we had tried some sound but Mike wasn’t really feeling it and so we had to react quickly and build something else. For example, the banging sequences in the house were probably one of the most complex and difficult. We had to get the right intensity and frequency that would allow you to feel scared. The thing I had to keep in mind through this entire sound experience was that this project would be viewed on TVs and laptops and over an array of smaller speakers. So whatever choices we needed to make needed to translate to that playback environment, to sound bars and even headphones. On the dub stage, Mike, and our re-recording mixer and I are all comfortable working together. We know how to make the silences and atmospheres, the clocks and the good Foley. Then for some of the big set pieces and the screams, we had to work together to make sure that those were going to translate how we wanted them to in the big room and also in the smaller arena. We actually mixed this show in a Dolby Atmos context. So anyone who is able to playback Dolby Atmos at home can hear this thing in its full glory. It’s pretty awesome. 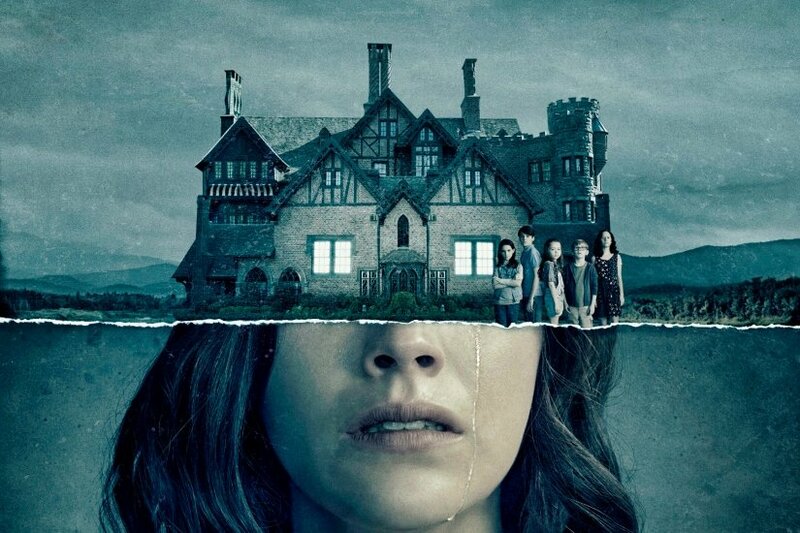 What was your approach to Hill House? How did you communicate the creepiness of the dwelling through sound? TG: We tried to make it cold and empty. I definitely parlayed some of the same sounds I used on the “Teddy Perkins” episode of Atlanta because it shared some of the same sound focuses. There were differences of course. We didn’t want to make the house ‘creaky’ because we wanted to be very articulate when we wanted to scare people. We didn’t want to draw attention to the house and make it creak unless it was a very specific event. One thing that’s particular to our approach to The Haunting of Hill House is what happens when ghosts are around. You first experience this when young Nell (Violet McGraw) sees the Bent Neck lady, who appears by her bed when she is sleeping. We play a cricket sound that starts to slow in pace and also lower in pitch. This was something we did in a few places where we didn’t want to give too much away to the viewers but we wanted to do something sonically that would signify a nonlinearity of time. Basically, when a ghost is around things are slowing down, like time is being manipulated. Or, it’s cold and things are slowing down. In the first episode, you’ll hear it a couple of times, the first was the cricket slowing down until we see the Bent Neck lady and then it stops. Then later in present day, when the father Hugh (Timothy Hutton) turns over in bed and sees a woman lying next to him, there is a frog sound that starts to slow in pace. On Nell’s second encounter with the Bent Neck lady in the parlor, there’s a clock that slows in pace and pitch and it turns into a bigger sound. So that was something we used in a few places when we wanted to play with a texture that could slowly bring the viewer out of reality and just creep them out. It’s something that just makes your head turn a little side-ways. I’m curious to know if the audience will notice these smaller nuances while playing back on their laptops or their phones if they’re watching it that way. Tell me about the specific sounds you created for the house. I loved the door knobs. Where did you come up with that sound? TG: The doorknobs were largely from my Foley crew. They gave us the doorknobs, footsteps, and anything that is humanized that could be a sound effect. If the sound needed a performance, Foley did an excellent job of that. Some sounds were a combination of layers, from Foley and hard effects. There’s that whole sequence with the doorknob in Episode 1, where the father, young Hugh (Henry Thomas), picks up young Steven (Paxton Singleton) and runs out of the house. Those doorknobs are from the Foley crew but we had to make the sound work with the production sound — the doorknob recorded onset. Some sounds were from production — sounds that they captured on the day. What about the dumbwaiter in the kitchen? Was that Foley, production, or hard effects? TG: We had about 50% of the dumbwaiter as a sound effect — the motor and a little bit of the shaking. But the buttons were Foley and the Foley team also created some interesting textures of the dumbwaiter going up and down. It was fun to allow the different departments of my sound team … to contribute different textures to some of the same places because everybody has a different view on how something might sound. I feel like I had a really great team on this one, and that was essential for us to succeed at this task in the amount of time that we had. It was fun to allow the different departments of my sound team — my effects editors and the Foley team — to contribute different textures to some of the same places because everybody has a different view on how something might sound. When it all comes to me — all these sounds that I didn’t cut myself — I get to take the artistry from the different teammates and shape it in editing. The dumbwaiter was one of those times where taking a little bit of flavor from a couple different people made for a sound that was really interesting and special. You mentioned the banging on the walls and doors. I loved the scene in young Shirley’s (Lulu Wilson) room, where her and young Theo (Mckenna Grace) are sitting on the bed and this banging starts to happen on the walls around the room. Can you tell me about the sound on that scene? TG: That scene was largely cut by one of my sound effects editors who gave me some really good banging sounds on the walls. He was doing some renovations to his house and so he went and recorded some actual banging on the walls in his house. We also used some sound effects from our library. Also, Foley contributed too, for the pictures rattling against the walls. That was a pretty difficult scene to mix as well because we had to spread the banging out around the sound field and we had to make sure that it was still impactful. Even though we had a bunch of layers already built, we were still working on that scene while we were mixing it. I had to add about 40% more sound, with some low-end impacts that you wouldn’t think would end up being in that scene, like thunder and cannon shots, to make the impacts feel big. We had to layer in some of these alternative sounds to make the banging feel impactful. There’s been a lot of talk about how close or not close this series is to Shirley Jackson’s book. That scene is one of the scenes that was very close and like an homage to the book, which was recreated in Robert Weiss’s 1963 version, The Haunting. There are two girls on the bed and it has some of the same camera sequences. It’s interesting to go back and see that scene and then watch this one again. In the basement scene, there is a great sound for young Luke’s (Julian Hilliard) flashlight and for the lightbulbs when young Theo later turns those on. How did you make the lightbulb and flashlight sounds? TG: I have this really interesting iridescent flicker sound in my library that I created for a movie about six or seven years ago. It has an interesting filament/glassy element too. So that is one of my signature sounds that we used here. We made some really good decisions about what interesting buzzes we could use and how far we could push keeping them playing through a monologue. I’m a big fan of interesting light buzzes. You can make things buzz and it sounds annoying and not interesting. For those basement scenes — including the scene in which young Hugh and the groundskeeper Mr. Dudley (Robert Longstreet) are in the basement cleaning up the mold and they’re discussing Olivia’s (Carla Gugino) blueprints — we made some really good decisions about what interesting buzzes we could use and how far we could push keeping them playing through a monologue. Mr. Dudley’s monologue in the basement was really interesting and we kept the iridescent bulbs buzzing while he was talking. We tried to figure out how long we could sustain those buzzes without being distracting, all the while making it feel uncomfortable through the dialogue.